This talk will discuss the convergence of anthropology and psychiatry and more broadly, the intersections of culture and psychopathology. Biologically-based neuroscience currently predominates research agendas for mental health and illness in the US and internationally. This research emphasis may appear to render the study of culture and mental health as nearly anachronistic. However the study of cultural processes is as crucial as it is complex for nearly every aspect of mental illness from etiology to outcome. Examination of cultural processes in relation to the classical anthropological triad of magic, religion, and science is developed for analysis of psychotropic medications. This talk draws on ethnographic materials from a study of ninety persons taking antipsychotic medications. It discusses the experience and meaning of these medications. Professor Janis Jenkins is a medical and psychiatric anthropologist, internationally recognized for her expertise on the convergence of anthropology and psychiatry. Her principal research interests are culture and psychopathology, psychopharmacology, gender, ethnicity, adolescence, migration, resilience, and qualitative methods. Her current research examines psychiatric disorder, cultural meaning, and structural violence among adolescents in residential facilities. Professor Jenkins’ indicative publications include (edited) Pharmaceutical Self: The Global Shaping of Experience in an Age of Psychopharmacology (2011) and (co-edited with Robert J. Barrett) Schizophrenia, Culture, and Subjectivity: The Edge of Experience (2004). Why should sociologists study digital media? Social life is increasingly being configured through and with digital media. What counts as ‘the social’ is increasingly framed via digital media. Digital media use and practice is structured through gender, social class, geographical location, education, race/ethnicity and age, all social categories with which sociologists have traditionally been interested. Digital media are integral parts of contemporary social networks and social institutions such as the family, the workplace, the education system, the healthcare system, the mass media and the economy, again phenomena that have long been foci for sociological research and theorising. Digital media configure concepts of selfhood, social relationships, embodiment, human/nonhuman relations, space and time – all relevant to sociological inquiry. Digital media have instituted new forms of power relations. Digital media have become central to issues of measure and value. Digital media offer alternative ways of practising sociology: of researching, teaching and disseminating research. Digital media are important both to ‘public sociology’ (engaging with people outside of academia) and ‘private sociology’ (personal identities and practices as sociologists) (see here for my previous post on this). Digital media challenge sociologists’ role as pre-eminent social researchers: sociologists need to address this. Digital media technologies can contribute to ‘live sociology’ and ‘inventive methods’, or new, creative ways of practising sociology. As this list implies, digital sociology goes well beyond simply a focus on ‘the digital’. It raises major questions about what should be the focus and methods of contemporary sociological research and theorising. As such, sociologists writing about digital media are important contributors to debates about the future of sociology and how the discipline can remain vibrant, creative and responsive to new developments and social change. In the context of modern western psychologised, techno-social hybrid realities, where individuals are incited constantly to work on themselves and perform their self-development in public, the use of online social networking sites (SNSs) can be conceptualised as what Foucault has described as a ‘technique of self’. This article explores examples of status updates on Facebook to reveal that writing on Facebook is a tool for self-formation with historical roots. Exploring examples of self-writing from the past, and considering some of the continuities and discontinuities between these age-old practices and their modern translations, provides a non-technologically deterministic and historically aware way of thinking about the use of new media technologies in modern societies that understands them to be more than mere tools for communication. This lecture charts the rise of ‘public engagement with science’, especially in Europe, and documents some of the criticisms that have been levelled at this broad initiative. The lecture also asks why there is seemingly so little engagement with the public by scientific institutions in Australia and in the region. Mike Michael is a sociologist of science and technology. He has been Professor of Sociology and Social Policy at the University of Sydney since August 2012. Prior to that he was a professor at the Department of Sociology, Goldsmiths, University of London. His research interests include the public understanding of/engagement with science, the relation of everyday life to technoscience, biotechnological and biomedical innovation and culture, the interface of the material and the social, animals and society, process methodology. Over the years he has worked on many substantive topics at the interface between science and society, including laypeople’s understanding of ionizing radiation, the animal experimentation controversy, contrasting cultural views of xenotransplantation, and the ethics of embryonic stem cell research. He has also explored the role that mundane objects play in the routines of everyday life – objects such as Velcro straps, TV remote controls, dogleads, sticking plasters, and walking boots. Current research projects address the complexities of HIV pre-exposure prophylaxis clinical trials (with Marsha Rosengarten), the interdisciplinary use of sociological and speculative design techniques to explore energy demand reduction (with Bill Gaver and Jennifer Gabrys), and the development of an ‘idiotic methodology’. He has published extensively and recent papers have appeared in such major journals as The Sociological Review, Theory, Culture and Society, Body and Society, and Science, Technology and Human Values. This lecture will be chaired by Professor Gay Hawkins. Members of the public are invited to attend this free seminar, after which light refreshments will be served. See NOW CFP for PDF. The title for the Narratives of War Symposium takes its theme from the way artefacts, diaries, media, art, music, memorabilia — letters, objects, the trappings of previous existence — indeed all manner of things, might be reflections and evidence of the traces left by war and conflict, and any aftermath and perhaps ensuing peace. Memories, personal and collective, and perhaps the public rituals of commemoration (although this is contestable) are built on traces – often indeterminable threads which serve to bind communities to a past and thus to a present and anticipated future. This is not an uncomplicated scenario as Pierre Nora has explored in Les Lieux de Mémoire (Nora, P, Les Lieux de Mémoire, 3 volumes, 1984, 1986, 1992, Gallimard; Paris. Papers are invited which explore this theme. Abstracts of 250 words should be presented with the presenter’s full name, affiliation, contact details (email, telephone and fax) clearly indicated, by 31 July 2013. As has been the practice for previous NOW symposiums, papers may be invited for submission for publication in the planned peer-reviewed monograph of the same name, Traces of War. For more information on the NOW Symposium or the Narratives of War Research Group – School of Communication, International Studies and Languages see the Narratives of War Research Group Website. Please note: The theme for the NOW symposium 2013 had been chosen before the current issue of the Journal of War and Culture Studies (Volume 6 ; Number 1) with its theme ‘ Traces of Conflict’ had been published. While the Journal is a useful resource and background for the NOW symposium, presenters at NOW are invited to work as widely as they wish within the theme. When Australian prime minister Julia Gillard was summarily dispatched in June by her parliamentary team, the British media were bemused. Hadn’t Australia weathered the global financial crisis with aplomb and avoided the European Union’s prevailing politics of austerity that brought legions of the discontented onto its streets? Much easier for the UK’s press and broadcasters to understand – and to ridicule – was another major Australian sacking only three days earlier, when national coach Mickey Arthur was summarily disendorsed by Cricket Australia. Gillard, who had presided over three Prime Minister’s XI cricket matches and once made a self-described “captain’s pick” for a Senate pre-selection, was removed with a federal election looming. But there was still time for her successor Kevin Rudd to make his love-struck media mark. Arthur’s dismissal, though, occurred with the first Ashes Test just over a fortnight away, a managerial manoeuvre equivalent to a pitch invader smother tackling a batsman just as the ball left the bowler’s hand. Mickey Arthur’s last-gasp replacement by Darren Lehmann was a sign of panic that Australia’s faltering national team may lose three consecutive Ashes series in England. In any sporting contest such a litany of failure would be unpalatable, but for many Australians it is a particularly nauseating prospect. At stake is the symbolic history of postcolonial progress, with cricket having played a notable role in signifying Australia’s separation from the Mother Country. The Ashes is a different kind of sport series. When the concept first emerged in 1882, the Australian federation was still almost two decades away. Beating the English at their own “gentleman’s game” became an index of Australian autonomy and a satisfying way of countering a persistently patronising attitude among English elites and media towards “the colonials”. Correspondingly, putting the New World upstarts in their place has been a pleasurable pursuit for those in the Old Country still basking in now-faded imperial glory. The Ashes has evolved into a vibrant, carnivalesque stage for the periodic rehearsal of British-Australian colonial history and stereotypes. It has become an even more noisy spectacle since some England fans formed the Barmy Army in the mid-1990s, borrowing its techniques of chanting, singing and opponent-baiting from soccer. 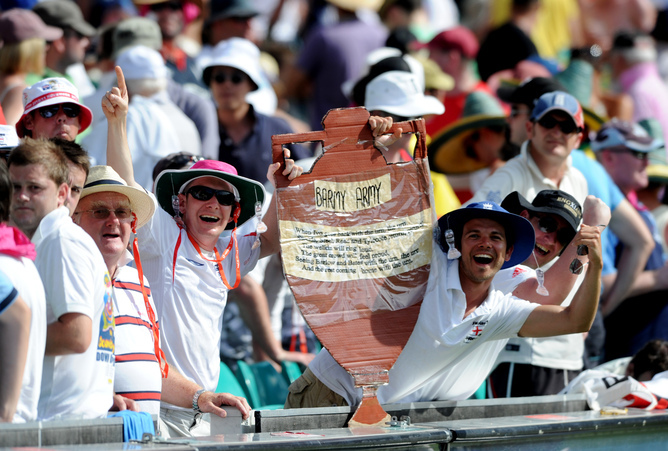 The Barmy Army never fails to mention the convict connection in Australia and the continuing constitutional role of the British monarchy. This is especially apparent after the failed Australian republican referendum of 1999, in songs like Convict Colony, You can sing sod all (“And I don’t believe that anybody sings as bad as you / AUSSIE CONVICTS”), and The Aussies love the English (“But when they had the chance to vote they voted for the Queen / God save your gracious Queen”). Sung to popular tunes by English bands like The Beatles and Oasis, this English-style larrikinism determinedly departs from the upper-class superiority of the Marylebone Cricket Club (MCC) establishment, which is itself the target of Barmy Army songs like MCC bloke! (“He’s reading the Times / His yellow socks / His sexist views / He’s falling asleep / He’s nearly dead”). This distancing from the class-inflected image of the gin-sodden, panama-hatted and stripe-blazered MCC member in the Lord’s Pavilion seeks to distract from the Australian side’s readymade rise-taking (as reflected in the less imaginative renditions of its Fanatics group) of the English team as etiolated progeny of its inbred aristocracy. The laddish demeanour of the Barmy Army (with only subordinate roles for the occasional ladette), most obvious in the deliberate gender offence of We all shagged Matilda (“and so did our mates”), is a curious echo of a historical manifestation of Australian masculinity. This is an image that resurfaced in the Australian media’s generally approving response to Lehmann’s appointment. 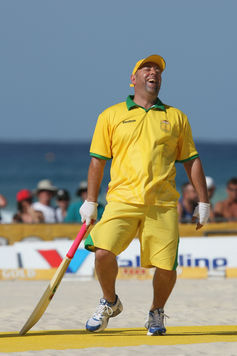 Among his non-cricketing credentials, the fact that Lehmann is an Australian (unlike the South African Arthur, and the German and New Zealand coaches of, respectively, the Australian soccer and rugby union teams) was especially welcome to Australian media commentators – a sure sign of national insecurity. Lehmann, nicknamed “Boof”, also has familiar bloke-like qualities – “all bald head, beer gut and a burning Benson & Hedges” and a “cricketing throwback to an age when BYO longnecks were as common on the Adelaide Oval hill as stubbies, shorts and sunburnt backs”. Unlike his predecessor, Boof would not set suspiciously cerebral homework for his players. This return to type was generally welcomed as an advantage in taking on “the Poms”. Aligning the coach with conventional codes of Australian masculinity also fitted well with its cartoon-like constructions by their English adversaries. It reveals the comfort of ritual rivalry that is far distant from, especially, contests with world cricket’s current superpower and another former British colony – India. While the Board of Control for Cricket in India flexes the newly-developed muscle created by its economic dominance, two mainly white colonial rivals can play their perennial game of compulsively re-drawing “Englishness” and “Australianness” long after it ceased to matter deeply to either party. The postcolonial pantomime that is the Ashes still pulls in the crowds. Neither nation wants to be at the wrong end of the horse along with sacked prime ministers and cricket coaches. In the 2010s, we witness a surge of protests and mass movements across the globe. All of these insurgencies have two elements in common. One is that they are intricately connected and facilitated by the Internet. The other is that occupying politically potent spaces in the city is crucial in gaining political leverage for pursuing reform. Connecting these two elements remains inadequately studied, however. The many conferences aimed at understanding the role of new and social media as tools of protest tend to remain in networks of cyberspace, and urban studies have also lagged in linking urban space with cyberspace. As individuals continue to live in a networked society, with one foot in the virtual and the other in the material world, the more coherent understanding of the changes and transformations in society should include an interrogation of the interdependencies between online and offline domains. How does cyber-activism translate into the production of urban spaces, and, conversely, how does access or lack of access to urban spaces reflect back to online mobilizations? This multidisciplinary conference aims to bring together young scholars and leading experts and theorists to better understand and re-theorize the ‘cyber-urban’ connections in urban Asia and the Middle East that affect people, networks, and social and built environments. We invite submission of papers that address the reflexivity of cyber and urban spaces, both empirically and theoretically, in different national contexts, pertaining to social change in Asia and the Middle East. How do cyber-urban connections materialize in the city? How can we better understand the interplay between online mobilizations and the production or occupation of urban spaces? How do emerging alternative or subaltern cyber-urban spaces inform urban theory? How do spaces (online and offline) contribute to insurgent activities? To what extent does insurgency need both cyberspace and physical space to be successful? How do socially marginalized people engage in online-offline forms of mobilization to gain political leverage or pursue their own projects? How do comparative contexts in Asia and the Middle East differ in any substantial ways in their cyber-urban insurgency experiences? Paper proposals should include title, an abstract (max 300 words) and a brief biographical sketch (max 150 words). Please submit your proposal by 1 September 2013 to Dr Asha Rathina Pandi at ariarp@nus.edu.sg. Click here for proposal submission form. Successful applicants will be notified by 1 October 2013 and will be required to send in a draft paper of 5,000 – 8,000 words based on unpublished material by 15 December 2013. Participants are encouraged to seek funding for travel from their home institutions. Based on the quality of proposals and the availability of funds, partial or full funding is available for successful applicants. Full funding would cover air travel to Singapore by the most economical means plus accommodation for the duration of the conference.